Chris Bjorin is a very skilled poker player, but it won’t come as a surprise if you have never heard of him. Bjorin is notorious for keeping a low profile. He avoids interviews and televised tournaments as much as he possibly can; consequently, there is little known about this person beyond what you find out at the poker table. Chris Bjorin was born in Sweden, but now resides in London. Chris Bjorin has won two World Series of Poker bracelets. His first bracelet came in 1997 while playing in the $1500 Pot Limit Omaha event, and his second came in 2001 at the $3000 No Limit Holdem event. 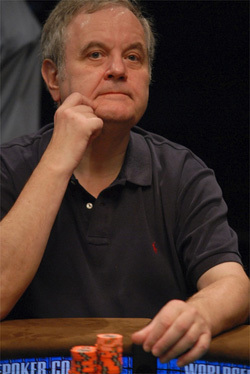 Chris Bjorin has also cashed at the WSOP Main Event three times, in 1992, 1997, and 2001. He has also played in the World Poker Tour, but has not yet made any final tables, although he has made a final table in the invitation-only Professional Poker Tour. As a testament to his skill, Chris Bjorin played in the 54 player $5000 Hall of Fame Poker Classic championship. His starting table consisted of himself, Phil Hellmuth, Howard Lederer, Daniel Negreanu, and Erik Seidel. Almost every table in the tournament had this much star power, and Bjorin did well in the tournament. Chris Bjorin is a very skilled poker player who was born in Sweden and lives in London. That is about as much as anybody knows about him.